Pat pat. Evening date. From now on. "What would you do if becoming my little sister could get you a lot of money?" I tried asking Mariko this question after school when we were preparing to go back home. Mariko looked down; raised her eyebrows and said "That would be troubling". When I asked her why, she got angry and started yelling at me "Idiot", "Insensitive!" and so on. I was surprised since she normally doesn't get angry like that. Or rather, I was scared. I couldn't answer when Mariko asked me "Why did you ask such a question?" in response. For the time being I said "It's just a hypothetical question" dodging the question. Mariko first made a baffled expression, then she blushed and laughed in embarrassment. "Seriously, did you really consider it?" After that Mariko forcefully changed the topic. In the hamburger chain's store in front of the station——McDannos, there seemed to be a limited product that's to be sold only for two weeks——the fiery burger. I was invited by Mariko to go and eat it together... but I needed to go back home and confirm what the smart key will do. This time, when I parted ways with Mariko I promised to absolutely compensate her for that and hurried home. It's always like that with Mariko. Once everything settles down I need to... compensate her. When I ran back like a storm to the Taishido residence, before I noticed the number displayed on the smart key's LCD display indicated Room 101. I was relieved, and thought 'Is it fine to continue it like this?'. These feelings intermingled and I couldn't make heads or tails out of my emotions. When I arrived at Selene's front door I took a deep breath to adjust my feelings and rang the room's chime. After about ten seconds the door opened. 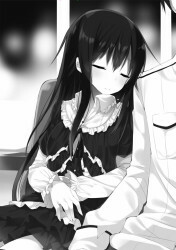 Peeking out of the slightly opened door's gap and tilting her head was a black-haired pretty girl. She had fine skin as white as snow. I feel like her complexion has improved compared to our first meeting. I nodded when I saw Selene's deeply-coloured eyes. "Rather than a particular business it's... um... it seems like the situation from the last week continues." She considered it and nodded. Normally she's acting as if she was in a daze, but strangely there are times where she acts based on her intuition. Her mother is a fortune-teller, maybe Selene has also inherited the talent. "...come in for the time being. The outside air is poisonous after all." "Hey hey. Are you back to being a shut-in?" Her slender hands stretched from the opened door. Selene took my hand and pulled me inside. Although we cleaned it together before, Selene's room already went back to its original devastated state. "Geez. Why is the laundry piled up in the corner of the room?" "...I think it's better than drying them. Even if they are folded they will need ironing anyways before they are worn, so it's more reasonable to just leave them as they are right from the start." 100% of Selene's cleaning ability is pumped into cleaning and segregating cloth accessories and materials associated with her work. Her remaining cleaning ability isn't enough to even clean the clothes she uses every day. "...but I properly decorated the case with my favourite figurines." As I looked inside acrylic case, on the shelves I saw neatly ordered figurines. Selene moved closer to me without making any sounds, her head was turned towards me. "Um, what is it, Selene-san?" "...the girl who did her best has to be praised." "Y-yes. Um... and more specifically?" I gently stroked her head. The black and shiny hair felt silky to the touch, it flowed through the palm of my hand. It really is beautiful. Selene murmured without any intonation and sat down where she stood. "...after happiness, it would be good to drink tea or coffee." "As usual you're always ready to slack off." She pointed with her finger at the text printed on her favourite T-shirt, it said 'working is losing'. Her policy is the same as ever. "...so, what does Onii-chan want?" I found two mug cups in the kitchen. Since there were black tea bags in the cupboard so I put one in each of the cups and poured the water from an electric kettle. With the cups that still had teabags in it I proudly puffed my chest. "What I want... become my little sister!" I put the cups on the table and sat on the other side of the table right in front of Selene. "...listen Onii-chan. I want to follow the way I have chosen. Without relying on Onii-chan, I want to live as an independent woman." She sipped the tea from the mug that still had a tea bag in it, and made a proud expression. I stood up and walked away, took a small dish from the kitchen and after removing a tea bag from the cup, I put it on the dish. "Onii-chan is worried about Selene as she doesn't even remove the teabag from the cup." "...it's a bother so I don't. It's a reasonable decision. I thought Onii-chan would understand it." She stared back at me with a sad expression on her face, I spat out a sigh in my mind. "Then Selene... What about... the school today?" Her cute middle school's uniform was still without a single wrinkle. After she heard that, her eyes that seemed like they enshrined all the sadness of this world suddenly glittered and tears started flowing. "I'll look into it later." "Considering you're very honest, I'll pretend that never happened... but you have to properly attend school from now on..."
"...Onii-chan. In fact, I don't know what I should do now." "...yes. I have determination to go down the path I found... but I don't know what's ahead." Selene who has decided what she wants to do and faced forward, but realized that her ability to prepare and execute plans is lacking... something like that. It seems like because I pushed her back, I've caused her to feel uneasy. Listening to little sister's troubles is Brother's duty and his joy. I told her what I thought. "Why don't you try going to school first? Although with the uncertain circumstances we're currently in, we don't know what's going to happen to you afterwards and we'll continue being uneasy." "...Onii-chan, what do you intend to do from now on?" It might be a coincidence but Selene asked me about the thing that I was wondering about deep inside... what do I intend to do... what I want to do. Yes, in fact the one who's looking for help is me. I'm anxious not knowing whether I can convince Murasaki-san alone or not. But it would be hard to say 'Let's go and talk with Murasaki-san together' to Selene right now. It didn't seem like she's able to hold out under the burden of two problems at once. "In the near future, I intend to find some time and go speak with Murasaki-san and confirm what's ahead. You should think about your own problems, don't worry about me." "...understood. I'm sorry for not being of help to Onii-chan." "Y-you don't need to apologize. It's Onii-chan's role to protect his little sisters." Selene nodded lightly and sipped the tea. "...what should we do today." "I wonder. I can't go back to my own room until the time comes... it would be great if I could stay here." She once again stared straight at me. "...Onii-chan... um... is it fine to continue calling you Onii-chan?" "Of course! There is no conflict between you finding your own way and me being your Onii-chan." Her not wanting to be my little sister yet calling me like that is kinda weird though. "...okay. Umm, if Onii-chan doesn't mind, I have a request." Selene energetically shook her head, her black silky hair fluttered. She continued with a tremulous voice. "...go on a d-date...with me..."
"Date... you want go out right now?!" "...to be exact, starting from the moment sun disappears. If I'm exposed to sunlight I'll disappear." "You were a mermaid earlier, when did you become a vampire?" "...if I incorporate an essence of chuunibyou, I'll be able to expand repertoire of possible outfit designs." It would be easy to say 'I wonder about that' and deny it but I didn't want to discourage Selene who finally started thinking positively. "Then, let's go out after sunset." "...thank you very much. If it's with Onii-chan, I'll go out." It's troubling that she can't go outside without me. But since Selene said she wants to go out by her own initiative, then it's a great improvement. I need to respect those feelings of hers. Selene and I waited for sunset to come, and headed to town. However, it felt somewhat like a failure, we went to the station, same as last week. I accompanied her as she bought a new mug——and when she said she wants to eat the new fiery burger. It was exactly as advertised, it was big and so spicy it made my tongue numb. Eating the large patty in a bun was enough. Finishing the crisp lettuce from the burger was a high level task. But the main problem, was its spiciness. At first glance, it was the unchanging ketchup and sauce based on a paste made from jalapeño, habanero and jolokia. I can still remember its hotness and how painful it was. I felt an illusion as if all the pores on my body opened, it was hard. Thanks to that, sweat was flowing from us like a waterfall. As our lips swelled, both Selene and I started laughing at each other's faces. Selene was interested in a game centre located in downtown. Since it was six o'clock in the evening, she couldn't enter as she was underage; frustrated, she promised to come back again to have her revenge. After that we spent time by looking at waves of people flooding the station, and Selene took a break in the park drunk after seeing a huge amount of people. We toured the city together, and around eight o'clock our date ended. On the way back to the mansion, Selene was sitting in the window seat of the bus. She quietly muttered when the bus has stopped at one of the stations. "...Onii-chan, what are you going to do from now on?" Her gaze was still directed towards the window. She stared blankly as the scenery appeared and disappeared. As the outside was dark, the window reflected her face like a mirror. I, who was sitting beside her, nodded. "Just like I said earlier, I'll confirm it with Murasaki-san first. In the future, there's a possibility everyone will scatter, but even if you live elsewhere you are still my little sisters." After taking a breath, I continued without pausing. "It's the best if everyone can stay together, that's why I will inquire with Murasaki-san if that's possible. That's the first thing to do." "To speak with everyone. Just like I did today with you." Continuing, a question spilled out of my mouth. "Speaking of which, why have you said 'Shall I make you big brother?!'? Back then with everyone else." Selene turned around and made a pondering expression. She tilted her neck and asked me instead, staring at me blankly. "As if coincidences like that happen!" "...we are sisters so we think alike." All five of them had different personalities, moreover all of them were at different ages. It was unlikely that Mika, the youngest child who was still in elementary school came up with these words. Maybe when I was sleeping, or when I was taking a bath, they must have talked about something just between the sisters. If I questioned her any longer it would be 'Selene has given it away to me!' situation. She was reluctant to say anything, I couldn't help but think it was a secret. Selene nestled up to me leaving her weight on my shoulders. A shampoo which gave out a rosy scent made my heart beat faster... no, it comforted me. "...please let me stay like this for a while." I nodded lightly. The shaking of the bus was pleasant, and I dozed off. I had family beside me. At a distance from which I could feel her warmth. It was a pleasant feeling, I felt my head drifting away. 1. colloquial and rather derisive term in Japan which describes a person at the age of fourteen would either act like a know-it-all adult, or thinks they have special powers no one else has. Thank you for translating this novel. Hey, will you continue translating this on a steady pace? I really like this novel since it doesn't include so much action and dark stuffs. I'm kind of fed up right now with that stuffs so I'm really looking for a slice of life / drama novel. Kudos to you! Hope you continue sharing this novel. This project most likely will not have a steady pace. It's a side-project, so Kry pretty much only does these in-between OSO and Antimagic. He may release them on special occasions, but it wouldn't have a steady pace.